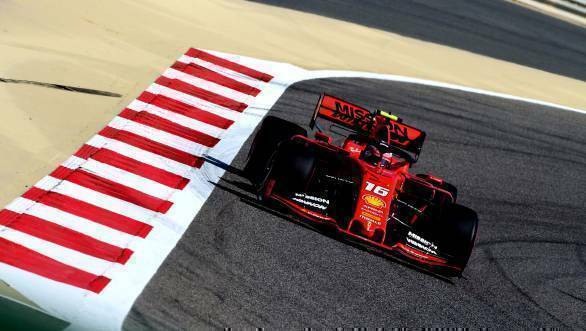 Charles Leclerc has claimed his maiden Formula 1 pole position, with a terrific performance during qualifying for the 2019 Bahrain Grand Prix. Leclerc's time of 1min 27.866sec was enough to keep him ahead of his Ferrari team-mate, Sebastian Vettel (who set a time of 1min 28.160sec), and it also allowed him to set a new track record at Sakhir. Leclerc had also managed to set provisional pole in Q2, with a time of 1min 27.985sec, which was identical to the pole time Vettel set the previous year. A time that was also the previous circuit lap record. Leclerc is now the second-youngest pole sitter in Formula 1, with only Vettel's 2008 Italian Grand Prix pole having been set by a younger driver. He is also Formula 1's 99th pole man, in the 999th race. The two Mercedes drivers took third and fourth position on the grid, with defending world champion Lewis Hamilton setting a time that was 0.030sec behind Vettel. Lining up alongside him is his team-mate, 2019 Australian GP winner Valtteri Bottas. Max Verstappen took fifth place on the grid for Red Bull Honda, while it was the Haas F1 car of Kevin Magnussen in sixth place. Carlos Sainz took the lead McLaren to seventh place on the grid. The second Haas F1, with Romain Grosjean behind the wheel took eighth spot, while ninth place went to Kimi Raikkonen in the Alfa Romeo. Lando Norris, in the second McLaren, qualified 10th overall. Full 2019 Bahrain GP Qualifying Results can be found here.